The magpi e, or to give the species the correct Latin name, the Pica Pica is one of our most recognizable British birds. With it’s distinctive black and white feathers, long tail and loud chattering cry it is very easy to spot and identify. The Pica Pica is a member of the crow family and despite the striking and appealing appearance, Magpies are not always a welcome sight. Although they are pest destroyers many people consider them scavengers and are unhappy with the fact that magpies will often take eggs and young of other birds during the breeding season. Although as yet unproven, this has been cited with having an adverse effect on the numbers of songbirds in the UK. 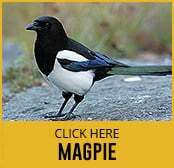 If you have a problem with Magpies on your land, it is important that you seek professional help and do not try to tackle the problem yourself. Along with other bird species, Pica Pica are protected by the Wildlife and Countryside Act 1981. This means it is illegal to try to take, kill or injure a magpie or to cause intentional damage to it’s nest or the nest contents. Such actions could result in a court appearance and prosecution. There are occasions however (such as where public health or livestock could be at risk) when control is necessary and in these instances, the Government may issue a licence to undertake such action. This allows an ‘Authorised Person’ to carry out a reasonable reduction on the number of magpies using controlled methods.